“The medium is the message.” Like most people, I certainly know the quote and have had an interest in Marshall McLuhan but I really haven’t seriously studied his work. After watching a documentary about him, my takeaway was that he understood that the proliferation of communications tools ushered in the age of the individual. We are truly living at the speed of light and building the future is a constant challenge. 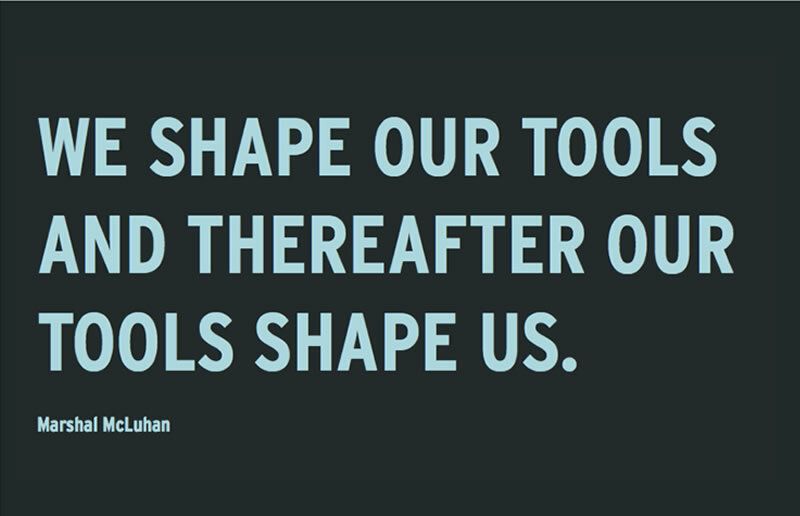 We shape our tools and thereafter our tools shape us. – Marshall McLuhan. Now that everyone has the ability to have their say, the “tools” that have allowed that to happen are indeed shaping us. There are new tribes forming and disbanding regularly. The new leaders are those who are able to galvanize followers (if only for a short time) around a cause, a vision, an ideology, a product or a process. Leaders today understand the values and beliefs of their followers and are able to communicate the points of intersection between those and their own. No matter the environment, communication only occurs when there is a mutual understanding and sense of purpose that exists between and among individuals brought about through meaningful discourse and exchanges. As leaders, we need to embrace the changes that are happening and use the tools we have to shape the future we want to create. Communication leaders can help others articulate and disseminate their ideas in meaningful ways to help shape the future. It’s not always comfortable but it is progress.